Philadelphia Gothic illuminates this stunning paradox: Perhaps the most enlightened, genteel, urbane, and humane of American cities in the first half of the 19th century, Philadelphia spawned a literary tradition of Lurid Crime, Weird Hallucination, and the Brooding Supernatural. 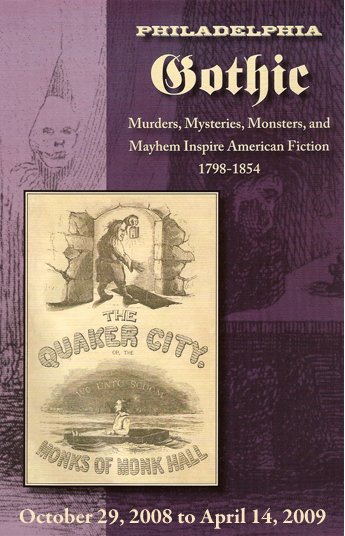 By the 1840s, “The Quaker City” had become a byword for sheer horror! This was the work of three largely forgotten Philadelphia novelists: Charles Brockden Brown, Robert Montgomery Bird, and George Lippard. This exhibition resuscitates these writers, through first editions of their major works and oil portraits that have never before been exhibited, and puts them in the company of Edgar Allan Poe, who absorbed their Gothic themes and obsessions while he lived in Philadelphia, the birthplace of the Gothic tradition in American literature.